The Talmud is often referred to as "the sea of the Talmud." Everything is discussed in the Talmud, from the laws concerning the daily life of a Jew vis-a-vis G-d, the various holidays, laws of business and property, and also a rich source of stories with varying subjects, all with deep meanings. One of the stories from the Talmud (Avoda Zara 65.) concerns the famous teacher, Rava. Rava was one of the more frequently mentioned Rabbis in the Talmud and many of his rulings are accepted today as Jewish law. Rava lived in Babylon during the period of time following the codification of the Mishna approximately 100 CE. Rava came to bring a gift to Ben Sheshek, apparently a minister in the king's service. Ben Sheshek was, unlike the rest of his contemporaries, not an idolater; he was a person who did not give credence to the popular idols of that time. Rava's visit coincided with an idolatrous holiday. Unlike the rest of his gentile contemporaries, Ben Sheshek was not celebrating the idolatrous holiday with the rest of his contemporaries in the local house of idolatry. The Talmud relates that Rava came upon Ben Sheshek as he was enjoying the pleasures of a special rosewater bath, (an expensive and very pleasureful bath) and attended by naked prostitutes who were giving Ben Sheshek a most extremely pleasureful experience. Ben Sheshek asked Rava, "tell me, do you have such pleasures in the world to come?" Rava answered him, "our pleasures in the next world are greater than this." "Better than this? Can it really be?" "You have the fear of the king upon you," Rava answered him. "We will not have the fear of the king." Ben Sheshek answered him, "Me? what fear of the king do I have?" As the two were conversing, a messenger of the king came and told Ben Sheshek that the king requested his immediate presence. Quickly Ben Sheshek left his pleasures and prepared himself to leave with the messenger. As Ben Sheshek turned to leave he said to Rava, "May the eyes of those who wish to harm you be put out." Rava answered him with a hearty "Amen." In a short time word came back to Rava, that Ben Sheshek had his eyes put out by the king. Now this small passage from the Talmud may not sound so deep at first glance, but it presents us with a certain understanding of pleasure and the rewards that await us in the next world. Let us understand one small point in the conversation between Rava and Ben Sheshek: Why did Rava explain that the pleasure that Ben Sheshek was enjoying was incomplete because Ben Sheshek had the fear of the king in him? This was a fear that was so small that Ben Sheshek even denied that he felt it. Why did Rava not explain that the pleasures that Ben Sheshek was enjoying were only transitional, that all earthly pleasures are limited in time and would come to an end? This was certainly an obvious difference! Rava answered him, that the pleasures that awaits those people in the next world are pure pleasures. It is not a pleasure that is mixed with any bit of sorrow. We can view the next world in one of two ways. Since very few of us are perfectly righteous, but rather we are a "mixed bag" with good deeds and also not so perfect actions. It is well known that a person who sins must descend into hell to be purified for those sins. For the good deeds that he performed he will receive a reward. This reward is the pleasure that we will receive in the next world. Now since we have sinned, we must be purified. This purification process is not pleasant. Depending on the sin and on the intensity of the pleasure received from the transgression, so too is the punishment. Like a father whose son is due to go on a class trip but has done something wrong. The father can punish him in one of two ways. Either he can tell him that he can go on his class tour, but the traditional spending money will be withheld from him thereby causing the son a reduction in the enjoyment of the tour. Or, the father can give him a punishment unrelated to the class trip, such as cleaning the house. In this form of punishment, the boy will get his spending money after he completes his punishment and will be able to enjoy his tour unencumbered by the punishment. Now it could be that due to the pain endured due to this sin, the pleasure for the good deeds would be diminished in the next world. It is this very view that Rava negates. Rava explains to Ben Sheshek that the pleasures in the next world are pure pleasures unencumbered by any pain suffered by the purification process. That means that after the soul is purified in hell, the soul is completely absolved of all traces of sin, which entitles him to a pure pleasure. 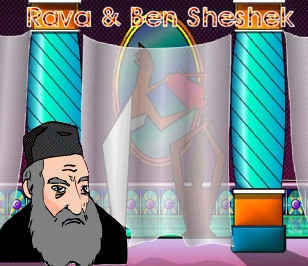 Unfortunately for Ben Sheshek, his blessing to Rava was accepted in heaven. Ben Sheshek, who appeared to be friendly towards Rava, was actually plying Rava and enticing him to join him in this lewd life. He was recognized by heaven as his enemy in so much that he tried to seduce a righteous man from the proper path. He, unwittingly, caused himself to have his own eyes put out.